The scene is a conference room, shades drawn, coffee cups scattered across the table as the scriptwriters gather for a brainstorming session. “But that just makes it all the more magical!” The first writer leaps to her feet, waving her pencil perilously close to the one next to her. The writers search each other’s eyes. “Are you sure we aren’t going too far?” the first one asks, looking over the notes she has made. “We’re fine,” the guy across the way assures her. So I get to say it. I get to say (or write): I WAS THERE. corwin and I woke up this morning in the Boston-area with plans to drive to Yankee Stadium. We checked the weather. Between the two of us we probably checked five different weather websites before we even got out of bed. The forecast was for 100% rain at gametime. Wunderground, Accuweather, Yahoo Weather, you name it. One whole inch of rain was expected. While we were getting ready to drive, a text came from a lawyer friend in New York inquiring if we wanted to sell our tickets. He was offering a large number for them. The entire drive down, small rain showers tried to start, but it never really became a downpour. We kept thinking, “we’re about to hit the rain.” But no. A spatter here and a spatter there, but nothing like a soaking one inch. Well, that sounded a lot better than what we’d heard before. We packed for rain. Umbrellas, rain ponchos, dry clothes and shoes in the car, et cetera. So we were ready. My seats are under the upper deck roof so we stay pretty dry. It was not raining when we parked. We walked to the Stadium in a pleasant breeze. My ears were a little chilly, but otherwise it seemed not bad out. We went into the Stadium a little before five o’clock and walked around for a while, decided to have some fresh cut ribbon fries (they take a whole potato and turn it into a giant pile of paper-thin ribbon and deep fry it), because, you know, it was a special occasion. We got to our seats at six o’clock and the grounds crew began removing the tarp. Looked like the game would start on time. A few minutes later, though, THE SUN CAME OUT. And then a rainbow. Who writes this stuff?? You just can’t believe it. The weather cleared, not a drop of rain fell, and it was a perfectly warm and balmy night in the Bronx. It’s as if the baseball gods did what they’ve done for Jeter his entire career. Even the weather was magically fixed for him. See? 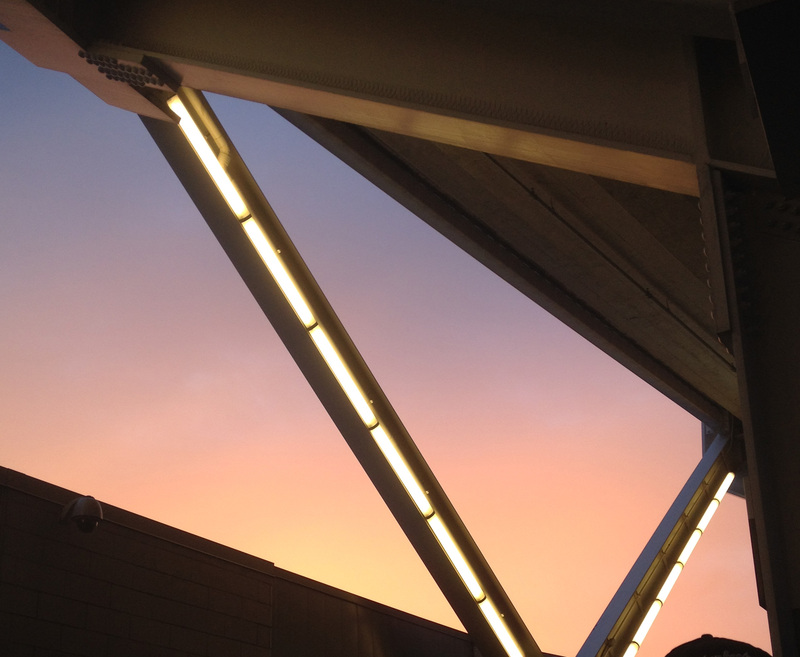 Here’s the sunset that Jeter literally walked off into. Then came the actual game. The game that I get to say forever after that I saw in person. Leave it to Jeter to give us the playoff atmosphere that has been missing for Yankees fans in recent years. In his first at bat he doubled off the wall–just a few feet shy of hitting a game-tying homer. “Flair for the dramatic!” said someone behind me. But it wasn’t a homer, not like his 3000th hit. Jeter is 40. You see his age. He’s lost a step, maybe two. His power is down. I thought, maybe that’s the story. The hit is emblematic of how he’s aged, but he can still be dangerous. The double he hit in the All-Star Game this year: same thing. Nope. That wasn’t the story. Nope. That wasn’t the story. He hit a ground ball, but instead of it turning into an inning-ending double play, the old Yankee ghosts were at work, the Orioles–who looked shaky all game–threw the ball away, and two runs scored. It was scored a fielder’s choice and an error, the fielder’s choice was Jeter’s second RBI of the game. You could easily argue at that point that Jeter would deserve the player of the game honors. Nope, that wasn’t the story. Hiroki Kuroda pitched an absolute gem after giving up homers to the first two batters he faced. After those two (Markakis and De Aza) he gave up only one hit (in the third) and sat down every other batter right through the eighth, nine of them on strikeouts. In the stands we were aware this might be Kuroda’s last time in pinstripes. It also might be Ichiro’s last game as a Yankee. That’s a bit sad. But it’s simply not on the same order of magnitude as saying goodbye to Derek Jeter. A lot of people were expecting Joe Girardi to pull some kind of stunt like he did in Mariano Rivera’s sendoff game last year, where he sent Jeter and Pettitte to the mound to pull him. (Reportedly Jeter said “It’s time to go.” Cue waterworks for Rivera.) In the press conference today Girardi said he would let it come to him. I think if the Yankees had been up six runs (or down six runs) in the ninth, maybe you would have seen him replace Jeter partway through the inning, and there would have been the ovation and all that. As it was, even when Jeter wasn’t at bat or on the bases, the “Derek Jeter” chant echoed throughout the Stadium over and over again. And in the 7th or 8th, we started chanting “Thank You Derek” instead. It would start in one section, and spread like a slow wave all the way around the stadium. I think we really gave Jeter a good sendoff. But that wasn’t the story either. Ultimately, Girardi didn’t have to manufacture a moment for Jeter. Jeter did that himself. Well, okay, with a little “help” from David Robertson, who gave up two home runs in the top of the ninth, meaning the Orioles tied the game. Any fan does that, you know. Looks at the scorecard and figures out: what would have to happen to bring my favorite player to bat again? One time I went to a game at Fenway with Bill Nowlin. The Red Sox had a good lead, but then blew it. “Don’t worry, Bill,” I said. “All it will take to bring David Ortiz to the plate representing the tying run in the ninth is for them to have the bases loaded and two out.” Bill’s reaction was “yeah right.” Guess what? That’s exactly what happened and Ortiz hit a walk-off grand slam. So I looked at my scorecard after the seventh. “Well, either the Yankees have to have a huge rally in the eighth or that was Jeter’s last at bat,” I said to corwin. “Well, or the Orioles are the ones with the big rally,” he pointed out. We would have happily settled for the win without that much drama. Really. So would Jeter. He said so in his post-game press conference, the broken-bat RBI would have been enough. Robertson left the mound with the game tied 5-5. Jeter would be due up third in the bottom of the ninth. Jose Pirela led off the inning. “If he hits a walk off, it will be the only time people will ever be angry at him for hitting a walk off,” I said. Pirela instead punched a singled into right field. Antoine Richardson came in to pinch run for him. Brett Gardner sacrifice bunted him to second, bringing Jeter to the plate. Storybook. Destiny. The baseball gods. You can’t believe your eyes, and yet there it is. Sports is the ultimate reality TV. You can’t script this stuff. It has to happen on its own. Jeter has always been a magnet for these moments. He’s always been able to punch a ticket when given the chance. Baseball is a game of being ready to jump all over your pitch when you finally get it. Jeter has epitomized that ethos for his entire career and, basically, tonight was no different. The only way it could have been better would have been if it was game seven of a World Series. I think Jeter would agree on that. Nope, that wasn’t the story this time. It wasn’t about team–for once it was about Jeter. We’ll miss you, Captain. Thanks for all the memories. The massive crowd trying to shoehorn into Stan’s. Perhaps some of them wanted to see the autograph Jeter put on the cash register in the Gatorade “My Way” commercial. Jeter’s first at bat: flashbulbs everywhere! Chants of “Derek Je-Ter” during Jeter’s third at bat. 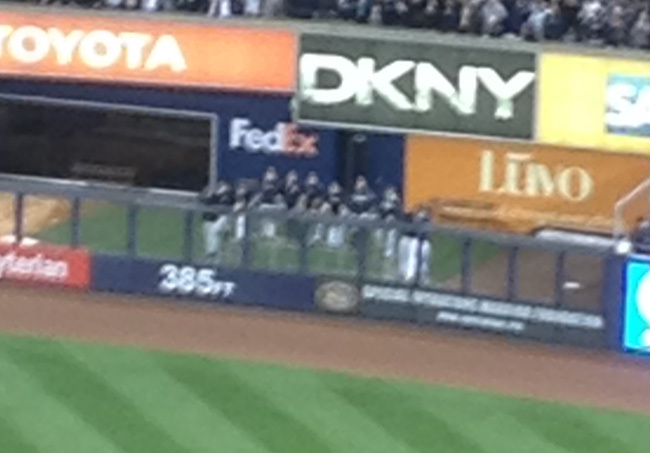 In the seventh inning, all the guys in the bullpen were watching what they thought was Jeter’s last at bat, too. 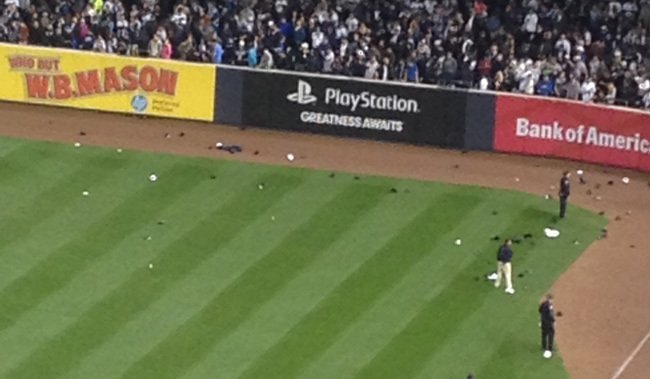 Fans in right field threw their hats onto the field in tribute to Mr. Jeter. That’s old school!! 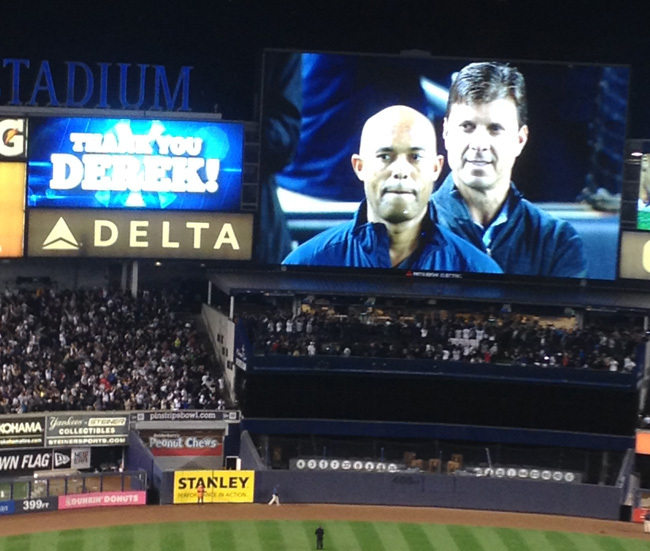 Several of Jeter’s old teammates, as well as Joe Torre, were there to surprise him when he walked off the field. 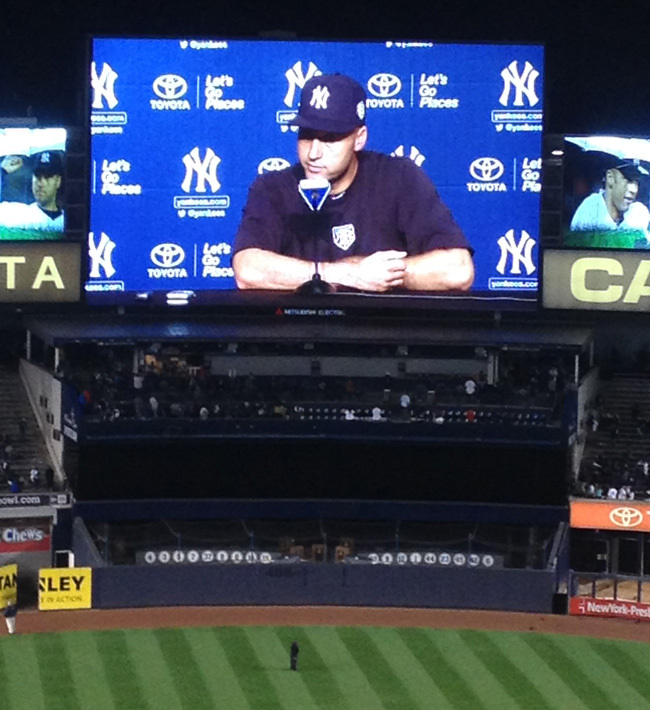 Fans at the Stadium got to watch Jeter’s postgame press conference live on the video board. This was written by Cecilia Tan. Posted on Friday, September 26, 2014, at 12:57 am. Filed under Baseball History, Great Games, Yankee Fan Memories. Bookmark the permalink. Follow comments here with the RSS feed. Post a comment or leave a trackback.